The strutting creatures that you occasionally glimpse from the roadside while driving through the more rural corners of Burgundy, the Franche-Comté or the northern reaches of the Rhône-Alps could hardly be better suited to represent both the majesty of the French culinary arts and an enduring appreciation for all things terroir. 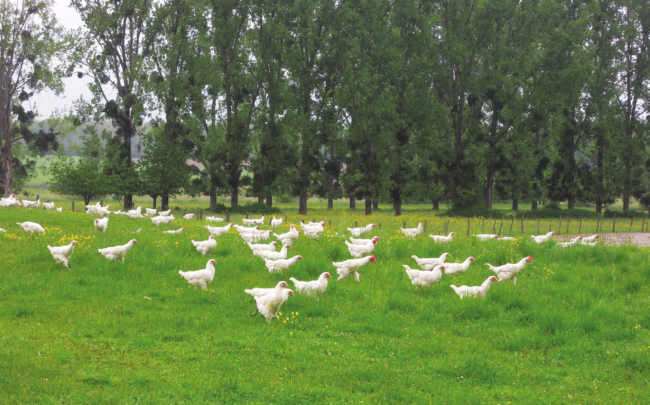 Bresse chickens have all the right colours for a start: with their red crests, clean white feathers and blue – yes, blue – feet, they’re the living embodiment of the French flag, Le Tricolore. But don’t be fooled by the look of these pampered, free-roaming poulets as they’re more famous for their flavour. Ask any chef worth his sel de Guérande, from Heston Blumenthal to chief Bresse chicken flag-waver Georges Blanc, and they’ll agree – the only clucker that belongs on the top table is one with an AOP Bresse (Appellation d’Origine Protégée) label. In rural France, back as far as the 17th century, it was always the farmer’s wife who looked after the chickens, in addition to making cream and butter to sell at market. They’d take their fine looking chickens along to sell and a spirit of competition soon evolved among the vendors. Actually, such was the value of these feathered friends that some farmers even paid their rent in chickens. By the 19th century, when gastro legend Brillat-Savarin declared the Poulet de Bresse to be ‘the queen of poultry and the poultry of kings’, proper competitions had begun in Paris (1865) but it wasn’t until 1957 that the product attained its illustrious AOP status. 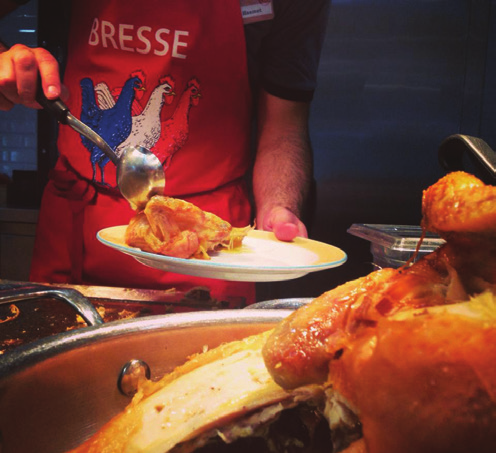 It remains the only poultry in France with such a label and today its worth is judged at the annual Glorieuses de Bresse competitions, which are held just in time for Christmas and the New Year. Breeding takes places across three départements in the Bresse region – the Ain, Saône-et-Loire and the Jura – all of which have bocage (a mixture of woodland and pastureland) upon which the animals can roam. Each chicken should be guaranteed at least 10sqm (some get more) and the breeder must give them maize and wheat, plus milk from their 35th day. They must also be allowed to graze on grass, worms, seeds and insects to complement their diet. There are around 180 breeders working today, producing around one million chicks per year. In order to maintain standards, each chick must pass through the selection centre at St-Etienne-du-Bois in the Ain, to verify all their characteristics: a uniform fineness of the skeleton, hardiness, blue feet and white feathers. After that, the poulterers (there are around six in the region) do their work, taking care not to damage the chicken’s fragile skin, and the meat is ready for the butcher’s shop or restaurant kitchen. Simple roasting, taking care to baste the skin regularly, or cooking in a cream sauce, are the preferred methods of preparing this most exalted icon of French cuisine.